Zhenwu, is called Xuanwu in Chinese, too. Wudang Zhenwu Stick is said to be a guard to the Taoism holy land. Wudang Zhenwu Stick Movement is rare in Wudang movement It is smart as a snake, calm as a turtle, simple but penetrating. It is so simple and natural that one can learn and perform easily. 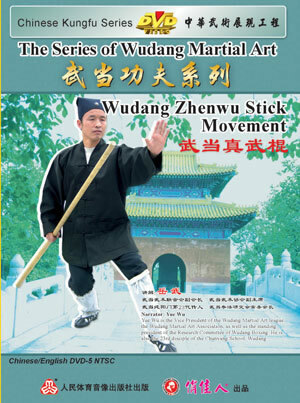 It is a great heritage of Wudang Stick Movement. Most performers use sticks that are long and slim. It emphasizes both spirit and strength. Therefore, it belongs to martial arts that require strength. If practicing frequently, one can increase the power of arm and wrist, and use its own strength freely. It would be beneficial for those who practice internal cultivation to learn this stick movement. For common amateurs, use the stick naturally is very important. At the same time, it’s suitable for group performance. It is not hard to perform the Wudang Zhenwu Stick Movement, so that it is suitable for fans at all ages.